The new Republican majority in the NC General Assembly are clearly bent on strangling the life out of the state's towns and cities. The Republicans have passed legislation just this week to make annexations much more difficult for cities. If a town can't grow -- which is clearly the end-goal of the Republicans -- then that town begins to die. Now comes the Templeton/Soucek assault on Boone's extra-territorial jurisdiction, which will benefit a few individual developers while ringing Boone's steep slopes with a potential for unregulated, wide-open (not to mention dangerous) chaos. The "local act" scheme for depriving Boone of its ability to manage growth on its surrounding steep slopes applies only to Boone, because -- hey! -- some powerful men desire it. (Apparently, the other municipalities in Dan Soucek's district didn't have either the a. steep-slope regs or b. a sufficiently rich developer to get Mr. Soucek's attention.) Another Republican-sponsored bill (drafted but not yet introduced in the General Assembly) seeks to outlaw extra-territorial jurisdiction generally across the state. More precisely, the draft language of the bill would prevent the state's municipalities from extending their ETJs into areas currently zoned by county government. That's an interesting distinction ... "areas currently zoned by county government." Since Watauga County has no zoning, we assume this particular assault on towns would not actually apply to Boone, but a lot of assumptions about our General Assembly get suddenly bumped askew after midnight. Just sayin'. What really caused this problem? You know the truth. Shame on you for using a picture like this when you know it was the landowner's fault and not construction. And, you know the truth behind this developement also. Argue you case using truth and facts. The Town of Boone has, by its disdain for following its own UDO (Unified Development Ordinance), bought this on itself. If power is abused, then power mus be removed. Deborah, What caused this problem was inadequate anchoring on an unstable slope, triggered by heavy rainfall. The White Laurel development was permitted by the Town of Boone prior to the current steep slope regs. 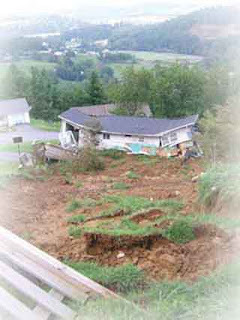 It was the failure of that slope, in fact, and the resulting damage to six homes that prompted in part the passage of Boone's current steep-slope ordinance two years later. In Watauga County, almost 1,000 homes and 300 undeveloped lots are in the path of potential landslides mapped by the North Carolina Geological Survey in 2009. There are no regs whatsoever in the county taking that analysis into consideration. But there are regs in the town of Boone addressing steep slopes and the development that can "by right" go up on them. Many of those steep slopes are in the Boone ETJ and would therefore be prime targets for unregulated development under Mr. Soucek's "local bill." Don't waste your time, Jerry. You just presented science and facts (two things Deborah doesn't subscribe to). Towns have to grow or they die, especially in places like Boone where churches, ASU, the medical center and others are tax exempt. Every time one of these places expands or builds anew, Boone loses revenue. Maybe some people think that's just fine, but they are short-sighted and ignorant of the consequences. All of Watauga County needs Boone and the county's other small towns. If not in Boone, where do you think banks and restaurants and retail and office establishments will build? These types of places, including much housing as well, depend on infrastructure like sewer and water, and on a relatively stable land and building value (meaning a manufacturing plant doesn't go in beside them for instance). If they build in the county, they have to use wells and private septic systems. This is unreasonable for most of these projects both structurally and financially. Plus, they want to build where most people can easily access them, like the center of a town. Plus that, I thought developers wanted water from Boone's new water intake. Do they think the Town will extend, on the taxpayers' dime, water and sewer into an area that has no controls whatsoever? I may be wrong, but I doubt it. This is a seriously dumb move by Senator Soucek. If the Town cannot expand, it will die, and all who live in Watauga will suffer for it. We should not give up local zoning control to the state. Just like we shouldn't give up state control to the federal government. We must protect current landowners and homeowners from developers and heavy industry who are not good neighbors to our mountain paradise. The White Laurel development did not conform to the existing regulations. In any case, sometimes tings happen that are caused by the forces of nature. Why do you not repeal the law of gravity if you can legislate the force of nature. The steep slope ordinance has nothing to do with the abuse of power by the Town of Boone both within the city limits and in the ETJ. The problem is with the abuse of the system. Thank you, Mr. Soucek for trying to remove this abuse from those in the ETJ that have no say in the laws Boone imposes on them. Jeff, you make some good points but I am not certain that they actually apply here. IF the town of Boone was planning on annexing the ETJ area, that would be a discussion worth having. As it is now however, it doesn't look like there is any plan to annex these areas in the foreseeable future. Perhaps what Soucek should be proposing is that if a town doesn't annex it's ETJ area after a set period of time, then the ETJ expires? Posters here seem to see every aspect of this issue as either black, or white. In reality, there are several shates of gray involved - including the fact that many of the residents of the area strongly support the protection of their property values that the ETJ provides. I am one of those that's conflicted on this issue. On the one hand, I think people should have the right to live on their property without interference from the town. And, I really think that if the town is going to control what can be done on our property, then we ought to have the right to vote in the election of town leaders. On the other hand, when my neighbor has the right to do whatever he wants with his property, even when it has a serious effect on my property, my family and my life, then I think some protections are in order. How would any of you like to have your neighbor 100 feet away decide to start a hog farm or a business which creates odors that dominate the area? Sometimes property owners must give up some rights for the overall good of everyone in the area. My right to swing my fist should end where your nose begins. If we had better restrictions on what can be put near residential neighborhoods then the ETJ would never have happened. Anonymous, I understand and appreciate your points. And I concur that it would make more sense for Soucek to have proposed a bill insisting that a Town annex an ETJ within a certain period of time. I admit to not knowing the all the facts here, but what I have seen over the years is that Boone generally ETJs areas that REQUEST that protection. Perhaps the people in the ETJ areas want the protections and water/sewer but don't want to pay Town taxes. I live in the ETJ. Most of my neighbors are pretty pleased with the set-up as is-no taxes but landuse protections. As I stated before, I think the real dangerous consequence of Soucek's bill (not counting the fact the bill is clearly intended to benefit just one or two developers) is that the Town will most likely not continue to offer water/sewer to ETJ areas unless it has some control over the development. It doesn't make sense to use Town taxpayer monies to run infrastructure for water/sewer into unregulated areas. Most studies prove that development strongly follows water/sewer, and running such services into unregulated areas causes chaos and unpredictablity into those unregulated areas. I really think this is all about some developers wanting to build high density on steep slopes but not wanting to follow the regulations to do so. Why would the Town use Boone taxpayer money to do so? Annexation would allow the town of Boone to continue to abuse its regulatory powers in these areas. is this what people want? Probably not as there is also new legislation on annexation being considered. Jeff...I don't think that the town is providing water and sewer to all areas in the ETJ - and I don't think their is any requirement that they do so. I do agree however, that the homeowners in the ETJ are probably pretty happy with things overall...I'm sure some have an issue with aspects of the town building code or whatever, but in my opinion, they are probably overall more satisfied than not. I do think though, that they should be allowed to vote in town elections - maybe not on purely local issues, but certainly should be able to vote for the politicians who will exercise control over them. No Taxes, no vote. Want to vote, annex and pay the taxes. County Resident, the problem is not only with voting. It is with abuses by the Town of Boone with how it administers its own code. Many if not most contractors will not work in Boone;s jurisdiction (or at least they would not until Obama killed the economy). "My right to swing my fist should end where your nose begins. If we had better restrictions on what can be put near residential neighborhoods then the ETJ would never have happened." I agree completely, and I think this is a great way to put it! I bought a house in the ETJ because the lack of any zoning at all in county areas worried me. Not everyone can afford to buy acres of land on either side of their house as a buffer, and when there's no zoning at all you're at the mercy of what your neighbors decide to do. No one wants a polluting industry or an industrial-size chicken house right next door. "County Resident, the problem is not only with voting. It is with abuses by the Town of Boone with how it administers its own code. Many if not most contractors will not work in Boone;s jurisdiction (or at least they would not until Obama killed the economy)." I just can't let this slide without a response. You can argue that Obama's policies may have made the recovery slower - this is something that we may never know for sure but at least it's arguable. But to say he "killed the economy"? Seriously? Where were you in 2008 when the sh** really hit the fan, and who was in power then and in the years leading up to that? I'm not going to argue that things are great now but at least the unemployment rate is down slightly and we're limping along in a recovery instead of free falling like in 2008. It doesn't help either side to be blind to basic facts and there's no way you can credibly pin this all on Obama. Is that a rule in Boone? I wasn't familiar with it. Do the students and the people who don't own property in Boone know this? I think we may have some violations going on. I have even heard that people who are living in the Hospitality House are being allowed to vote. We need to look into this. Logic police. I don't disagree with what you are saying but since this thread has been productively on topic for a change, can we keep it about the ETJ issue? But you overlooked another whopper in that same post: "Many if not most contractors will not work in Boone;s jurisdiction." Really! Gosh, you could've fooled me. Student apartment housing everywhere and quite a bit of commercial development on the B'Rock Road, some of it performed, I think, by the notorious Templetons. But I guess we shouldn't believe our lying eyes. Believe the Tea Party Talking Points instead? I know, I debated whether or not to say something and couldn't just let that be said without responding. But I do agree that it's best to stay on topic, especially when it's a time-sensitive and important one like this one. I promise to keep to the ETJ issue from here on out! And thanks to Henery. I had a feeling the Boone construction comment was BS too, but didn't know enough about the topic to respond. Now that I think about it, there's that new apt. complex next to Frogurt, the Council Oaks development, the new law office downtown, the Dollar General at New Market, the animal hospital on the 105, the new Marriott... can we come up with more? Doesn't seem like builders are running away from Boone! Thanks Logic police for your considerate reply. I do support the ETJ but I will have to admit that I have heard many, many times that the bdlg and inspection people in Boone are way over the top. One contractor told me that it costs significantly more to build a house in Boone because of all the "nit picking". A strong building code is fine, but tempered with a little common sense, please! Of course, that's a separate issue from the ETJ and it could be addressed without abolishing the etj. So renters and students that live in dorms should not vote. Is that what you are saying? The current economic crisis started with the home loan problem caused by Barney Frank and his ilk, including Obama. Obama then made things worse. At least stripping Boone of the ability to abuse its own codes in the area known as the ETJ is a good start locally. Hello - Its about the ETJ. If you live (own property) in the ETJ, and you want to vote in Town elections, annex, become part of the Town in which you want to vote. This is not a mystical thing. It is the law as it currenly stands. Don't like it? Fine. Yep! Simple. Let's do it. From now on let's have everyone bring a copy of their Federal Income Tax return before they are allowed to vote in National elections: A property tax receipt for town and or county elections and State Income Tax returns for state elections. Of course, since we won't be requiring a voter ID it will be hard to prove that it's actually you and your return, but hey - it's a start.